Free: over 65 years old, kids up to 6 years old, persons with disabilities and members of the Journalist Register. Combined ticket: €. 8,00 ((Municipal Gallery of Modern Art, Former Town Hall, Siamese Art Museum "Stefano Cardu") valid for one week. Combined reduced ticket: € 4,00 (students from 6 to 26 years old) valid for one week. The Municipal Art Gallery is located inside a neoclassical building in the Public Gardens. It houses two permanent collections: Ingrao Art Collection (19th-20th century) and Sardinian 1900s Collection (20th century Sardinian artists). The Municipal Art Gallery is located inside the Public Gardens. The building lays itself at the end of the main promenade surrounded by the green, just before the slopes of the hill of Buoncammino. In the past it was the site of the royal armoury, but the 18th century building which houses it, was destroyed by an explosion and later rebuilt in 1828, according to the design of the military engineer Carlo Boyl of Putifigari. Characterized by friezes and elements of neo-classical style, made of limestone from Bonaria's hill, the new facade is surmounted by a simple and elegant tympanum on the top of which there are three sculptures, made of Carrara marble, given by the Count Boyl himself. For a long time it was used as a barrack and warehouse, but at the end of the 1920s, it was finally adapted by the architect Ubaldo Badas from Cagliari, to house the exhibition space. 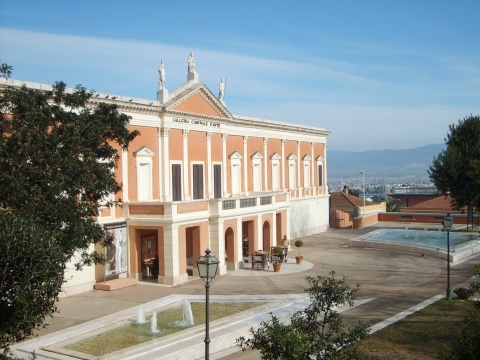 Inaugurated in 1933, it houses valuable works of Italian and Sardinian artists (Ingrao Art Collection and Sardinian Collection !900-1970), acquired by the Municipality of Cagliari also thanks to the important donations made by benefactors and art lovers. Recently, the Sardinian Collection has been enriched by three sculptures of Francesco Ciusa, that well outline his thematic and stylistic evolution. Headquarter of the Specialized Library in Art History, the Municipal Gallery offers library loan, also possible in the green area adjacent to the Public Gardens. In its spaces are also promoted several initiatives, including educational tours and recreational activities for children and teenagers, temporary exhibitions, cultural events, music festivals and theatre performances. The Municipal Art Gallery provides also a service for blind visitors. Starting from September 27th 2011 is active a dedicated path for blind people called SeSaMoNet. The route is part of the project WiMove from the program ELISA, that has the Municipality of Cagliari among the partners, and the University of Rome La Sapienza, as the material author of the installation. The route winds through the rooms housing the Sardinian collection, where it was built a methacrylate platform containing numerous RFID tags, through which the visitor can receive information about the art works and the artists. Paintings and sculptures "liven up and speak about themselves", only by touching with a stick the modular elements of the platform. The microchips installed send electronic impulses that are transmitted immediately to the mobile phone supplied to the visitors. SeSaMoNet also provides information about the position, signalizing any obstacles on the way. The museum staff provides for free the complete kit to use the system, and remains at your disposal for any further information.